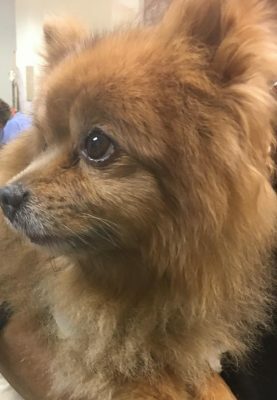 Peanut is an adorable 14-year-old Pomeranian, but don’t let his soft fluffy fur fool you. He is a cancer-fighting dog. Audra Boshek brought Peanut home when he was just a puppy. He quickly became a big brother to Audra’s 10-year-old daughter, Sabryna and 3-year-old Chihuahua, Lola. In August 2017, Audra noticed Peanut had difficulty urinating, including wincing as if in pain. After also noticing blood in his stool, she contacted her primary care veterinarian. Peanut had always been very healthy. During a rectal exam, Peanut’s primary care veterinarian felt a mass near his prostate. He was referred to SAGE – Centers for Veterinary Specialty and Emergency Care, PetCure Oncology’s newest partner site. Needless to say, Peanut’s family was shocked and scared to hear he may have cancer but remained optimistic. After a CT scan confirmed prostate cancer, Peanut and Audra met with specialist Michael Kiselow, DVM, DACVIM (Oncology) to discuss treatment options, including SRS, a non-invasive procedure that would directly target the tumor with radiation in three short treatments. Audra felt SRS was the only option for Peanut since she was worried about the side effects of both conventional radiation treatment (20–30 sessions under anesthesia) and chemotherapy. Peanut visited PetCure Oncology at SAGE for his SRS treatment three days in a row. The family lives in nearby Foster City, CA so Peanut was able to return home after each session. The PetCure Oncology staff at SAGE was in constant contact with Audra before and after treatment – even texting photos of Peanut. Audra was surprised that after his first session, Peanut had transformed from a sick and lethargic dog to his old energetic self. 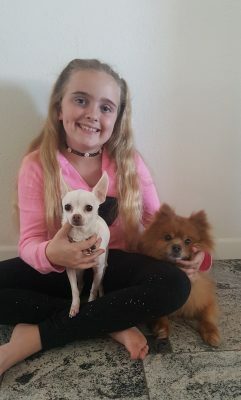 The happy family – Sabryna with Lola on the left and Peanut on the right. After his third and final treatment, the staff held a graduation party for Peanut. Not only was he the first patient at PetCure Oncology at SAGE, but he was also the first pet ever to be treated with Varian’s HalcyonTM Treatment System, an advanced delivery mechanism for radiation therapy. “It was a nice feeling to leave PetCure Oncology at SAGE knowing Peanut received the best treatment,” said Audra. Within one week, Peanut was having an easier time urinating and was the most energetic he had been in months. Peanut had his two-month checkup in October and is doing well and is getting better each week. Dr. Kiselow informed Peanut’s family that all the signs are promising since he is eating, playing and urinating just fine.